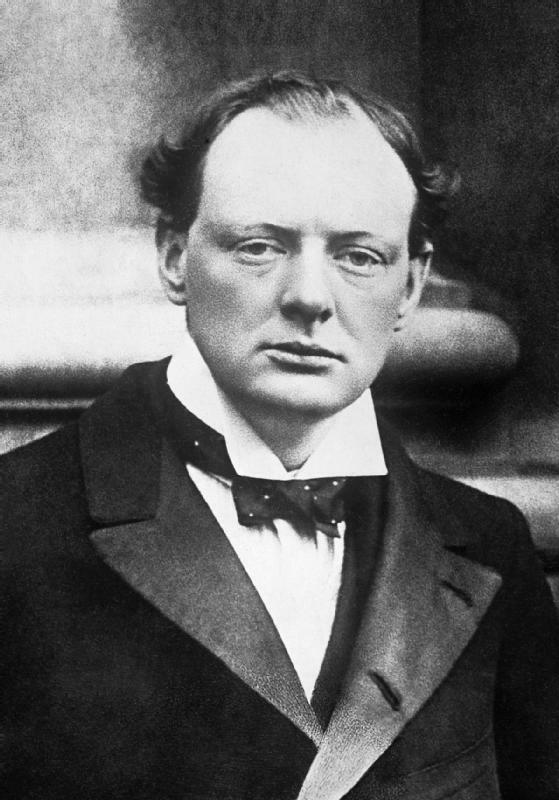 Winston Churchill, First Lord of the British Admiralty, requests that Chief of the British Imperial General Staff detail a plan ‘for the seizure of the Gallipoli Peninsula by means of a Greek army of adequate strength, with a view to admitting a British fleet to the Sea of Marmara’. The Greeks produce a detailed plan for the capture of Gallipoli which would involve approximately 60,000 troops. Churchill believes that Turkey is unlikely to remain neutral between Britain and Germany and that the Turks would side with Germany. Winston Churchill in 1904. From the collections of the Imperial War Museums. Licensed under Public domain via Wikimedia Commons. 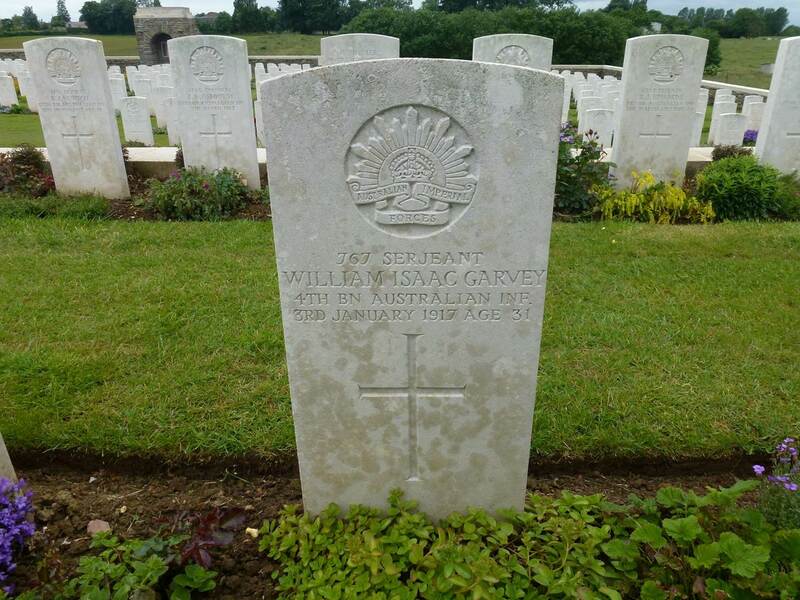 William Garvey’s headstone, Bull’s Road Military Cemetery, France. William James Garvey (aka William Isaac Garvey) was born in Warren to William Gothwell Garvey and his wife Alice. In February 1902 he enlisted in the Boer War. He was living in Molong at the time, and nominated his sister Elizabeth, also of Molong, as his next of kin. In August 1914 William enlisted for WWI. A butcher by trade, he joined the 4th Battalion F Company as a cook and embarked from Sydney in October 1914. William served in Gallipoli, and in October 1915 was promoted to Sergeant. In January 1917 Sergeant Garvey was killed by a shell along with several other men at the mouth of a dugout known as the “Chalk Tunnel”. He is buried in Bull’s Road Military Cemetery at Flers in France. William Garvey is commemorated on the Ancient Order of Foresters Orange Roll of Honour and on the World War I Roll of Honour on the southern face of the Orange Cenotaph. In 1923 the Anzac Memorial Avenue of trees was planted along Bathurst Road to commemorate fallen WWI soldiers. A tree was planted in honour of “Pte WT Garvey”; it was donated by the Ancient Order of Foresters. Very few of the trees are still standing today. Molong Express and Western District Advertiser, 1 July 1916, p. 4. Molong Express and Western District Advertiser, 18 November 1916, p. 9. Molong Express and Western District Advertiser, 5 January 1918, p. 8. George Joseph Thew was born in Burwood in 1893. He was the first child born to George Joseph Thew and his wife, Jane Elizabeth (nee Growder). When he enlisted in Sydney in September 1914 George was living in Manildra, where he worked as a packer. George embarked for Egypt in October 1914, a private in the 3rd Battalion. Private Thew was killed in action in the Battle of Lone Pine at Gallipoli on 7 August 1915. His body was retrieved several days later, identified by his pay book located in a pocket of his uniform. He was buried in a mass grave near Brown’s Dip; the Dean of Sydney presided over the burial service. George Joseph Thew is commemorated on Wellington Cenotaph and Panel 21 of the Lone Pine Memorial on the Gallipoli Peninsula in Turkey. Norman Ernest Davis’ grave, Lemnos. Image courtesy National Archives of Australia. Norman Ernest Davis was born in Orange in about 1891. 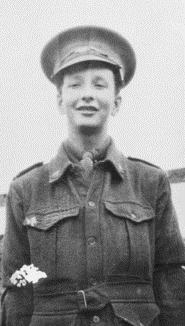 Prior to enlisting Norman had been a member of the Orange Rifle Club for a period of two years. Norman was working as a miner in Broken Hill when he enlisted in August 1914. He embarked from Adelaide in October 1914, a Private 10th Battalion, B Company. He served in Egypt and Gallipoli. 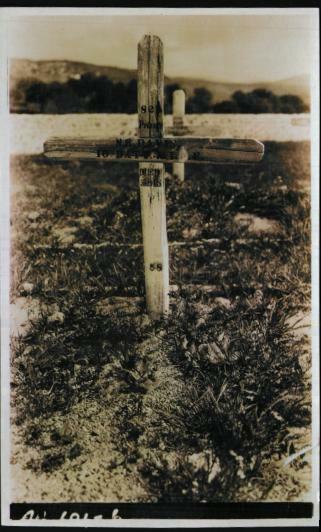 On 18 August 1915 Private Davis sustained a gunshot wound to the head. He died thirteen days later of a compound fracture of the skull and septic meningitis. Norman had nominated “C. Davis, Orange“ as his next of kin on his attestation papers, but Base Records Office was unable to locate him to pass on Norman’s war medals, personal effects and over £72 in deferred pay. A man called William Davis in Katoomba claimed to be Norman’s father but the Base Records Office in Melbourne was not convinced. The Office tried for several years to locate a relative, but their attempts proved fruitless. According to the Base Records Office: “exhaustive efforts have been made to trace [next of kin] but without result.” Private Davis’ war medals were forwarded to “untraceables”. Norman Ernest Davis enlists. Norman is commemorated on the Centenary of WWI in Orange Honour Roll; he would die of wounds received in Gallipoli on 31 August 1915. William James Garvey enlists. William is commemorated on the Centenary of WWI in Orange Honour Roll; he would be killed in action in France on 3 January 1917. The Battle of Saint Quentin, aka the Battle of Guise begins. The 2 day battle is a tactical French victory; the Allies secure an orderly retreat. George William Lawson Cooper was born in Orange in September 1892 to William and Agnes Cooper. George was the fourth child of six born to the couple. When George was a young boy the family moved to Sydney, where his father became the Warrant Officer at the Rifle Range in Randwick. As a boy George attended Crown Street Public School. After leaving school he became a linotype engineer with the Daily Telegraph. George enlisted on 28 August 1914, just three weeks after recruitment opened. He embarked in October, a Private with the 3rd Battalion. In April 1915 George joined the Mediterranean Expeditionary Force in preparation for the landing at Gallipoli, and in May was promoted to Corporal. George was reported missing in action following the battle of Lone Pine in early August. It wasn’t until June 1918 – almost three years later – that Corporal Cooper was officially declared killed in action. He has no known grave. George William Lawson Cooper enlists. George is commemorated on the Centenary of WWI in Orange Honour Roll; he would be killed in action in Gallipoli on 6 August 1915. The Battle of Heligoland Bight is fought. This is the first major naval battle between British and German ships in the North Sea. The Royal British Navy sinks three German light cruisers. Image courtesy Australian War Memorial. Private Powter embarked from Sydney with the 15th Reinforcements aboard HMAT Star of England on 8 March 1916. He transferred to the 53rd Battalion in Egypt the following month, where he served as a stretcher bearer. In June Ernest proceeded to France, where he continued his work as a stretcher bearer. It appears that Ernest was admitted to the 8th Australian Field Ambulance Station, but an entry on his casualty form dated 1 January 1917 states: “no further report of the man”. It was not until 21 March 1917 that Ernest was reported as having died of wounds received in action. Ernest’s father and stepmother were not advised of his death until April 1917, and his final resting place is not known. Ernest’s name appears on the Australian War Memorial’s Boy Soldiers of WWI Honour Roll, and he is commemorated on the Villers-Bretonneux Memorial in France. In loving memory of our dear son and brother, Private Ernest Powter, died of wounds in France, 1 November 1916. Inserted by his sorrowing father, stepmother, and only brother, Claude. And longed to clasp your loving hand. To part with one we loved so dear. But we’ll meet in a better land. Ernest’s older brother Claude Jabez Powter also served in WWI. Ernest Lachlan Powter by Meg Vaughan, Ernest’s great niece. During the simpler times of my childhood, Sundays were often reserved by families, for church and then the family Sunday lunch. And so it was for me, with my grandmother’s Sunday roast a ritual. When the family sat at her big dining table and feasted on lamb and roast veggies, we were always aware of the presence of an absent family member. On the wall, watching over the noisy proceedings, was a framed photo of two young men, one in military uniform. They were my grandmother, Annie-Laurie’s, two adored older brothers Claude and Ernie. The younger of the two staring proudly out at us was 15 year old Ernie on the eve of his departure to defend the Empire in the First World War. He was never to return and my grandmother’s heart was still filled with undiminished sadness. The strength of this bond with her brother, shared with her surviving brother Claude, was born out of a difficult childhood that the three siblings endured by virtue of love and mutual support. As is often the case, it was loss that forged their bond. The children’s mother, Catherine, died before they had reached their teens. Their father soon remarried. Step-mother Edith was a strict Salvation Army devotee and quickly established a harsh and alienating regime for the children from which their ineffective father failed to protect them. This drew them even closer together, with elder brother Claude assuming the role of protector to Ernie and Annie-Laurie, a role he was to never relinquish. He and my grandmother remained very close throughout their lives and as such Uncle Claude would often be at the dining table with us on those Sundays, enhancing the atmosphere with his warmth and love. It was not unusual on these occasions for my grandmother to re-tell the story of Uncle Ernie’s misadventure to the Western Front. In the telling, her grief was always palpable. She described how young Ernie, brimming with the enthusiasm of adventure and invincibility, had lied about his age and enlisted in the AIF at 15 and, as a stretcher-bearer, had tragically died only eight months later at Flers in France. Her story always left a strong impression on my young imagination as she expressed great pride in her young brother’s daring and courage mixed with the bitterness of the loss she still felt all these years later. 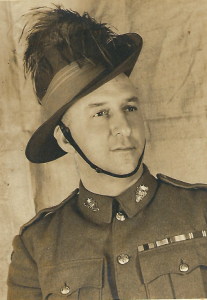 In adulthood, I came to realise that Uncle Ernie’s story defined an important part of our family’s identity, that our family was, like 61,516 other Australian families during World War One, contributors of the ultimate gift to the nation. My grandmother possessed a letter which was written by Uncle Ernie to her when he was in Egypt. I believe it to be the last letter he wrote. It was written on very fine white paper. He told her of the heat in Egypt and of his boredom waiting around with little to do. He said how he looked forward to leaving Egypt and being part of the action. He also related that he had visited a market and bought some trinkets for my grandmother. He told that he had sent these to her. He signed off that he loved her, his dear Laurie. The quiet presence of Uncle Ernie’s story in my family’s life was much enlivened in April this year when out of the blue I was put in contact with Victor [Gordon]. We had a wonderful conversation as he told me of the genesis of the MEMORATE.COM.AU installation at the Orange Regional Gallery, and the central role that Uncle Ernie had been given as the exemplar of the Australian WW1 boy soldier. When he extended an invitation to me to attend the opening I felt at once privileged and humbled to be representing my family at such an unexpected honouring of my great uncle. In the following days I wondered what the young Ernie would have thought of being remembered in such a meaningful way by the city of his birth. I thought, with some sadness and regret, of my grandmother Annie-Laurie, of Uncle Claude and my mother Gwenda, that they could not see this very public acknowledgement of the sacrifice that Ernie and ultimately they made. Standing before Victor’s truly beautiful portrait of Ernie was so moving. Victor had captured his youth, his naivety, his optimism and the larrikin glint in his eye. He had brought this ordinary boy, a stretcher-bearer, my great uncle, to life again. Along with my reflections on my family’s history, MEMORATE’s powerful and incisive vision has caused me and no doubt many others, to contemplate the bleak industry of war. I am sure it will be an enduring and valuable endowment. Claude Jabez Powter was born in Orange in 1896, the first son of Jabez Langley Powter and Catherine Laurie Powter. 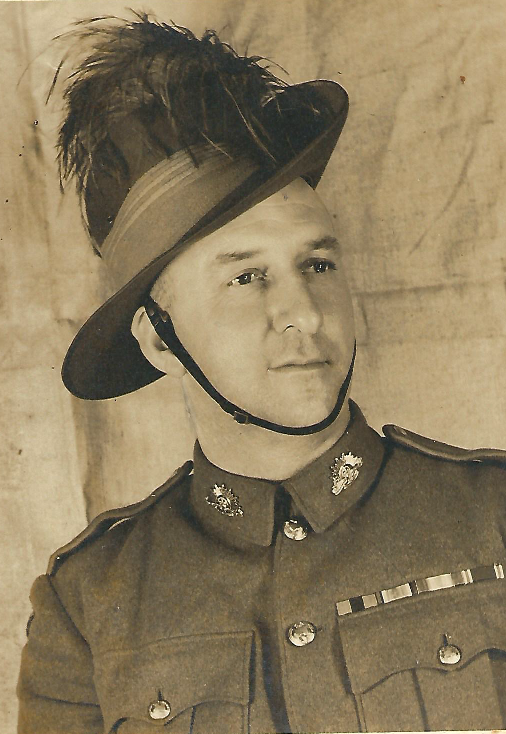 In December 1915 Claude enlisted as a gunner with the 36th Australian Heavy Artillery Group. He was living in Petersham and working as a shop assistant at the time. He married Stella Irene Byrnes before he embarked from Sydney on HMAT A72 Beltana with the 6th Reinforcements on 13 May 1916. For conspicuous gallantry and devotion to duty. When the battery position had to be vacated, this man, with one N.C.O., remained behind under heavy fire, and rescued stores necessary to put the guns in action in their new position. On a later occasion, these same two men maintained communication by signalling lamp between the F.O.O. and the battery position, under very heavy fire, enabling effective fire to be brought on the enemy. Claude returned to Australia on 11 June 1919 and was discharged from the AIF the following month. In 1937 he had the honour of being part of the contingent of servicemen representing Australia at the coronation of King George VI in England on 12 May 1937. Claude was one of 25 officers from New South Wales selected from 350 applicants. Claude died in Sydney in December 1974. Claude’s younger brother Ernest Lachlan Powter also served in WWI. He was the youngest known recruit from Orange to enlist, and he died of wounds in France aged 16. 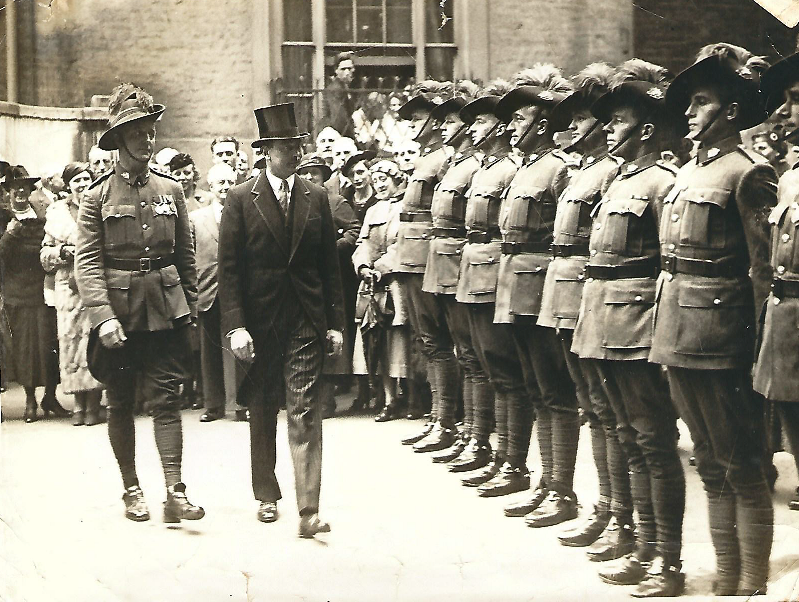 Claude Powter (left) in London in 1937 during the coronation of King George VI.